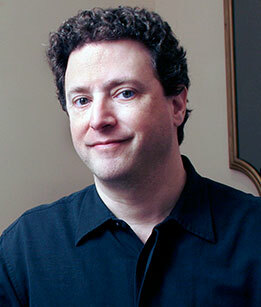 Donald Friedlich is a leading figure in the contemporary jewelry world. 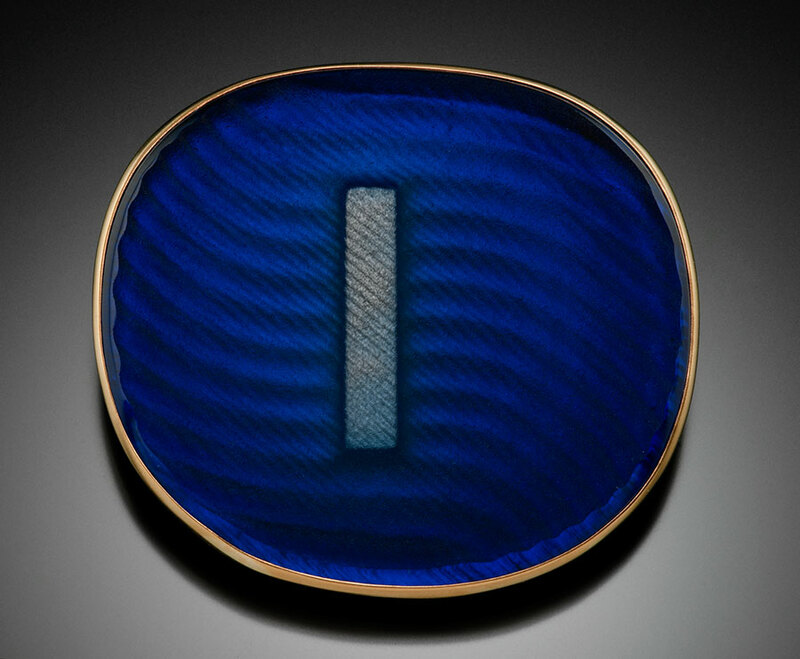 By combining varied glass techniques with precision metalsmithing, he creates wearable glass sculpture – sophisticated, elegant and at the same time, fun. 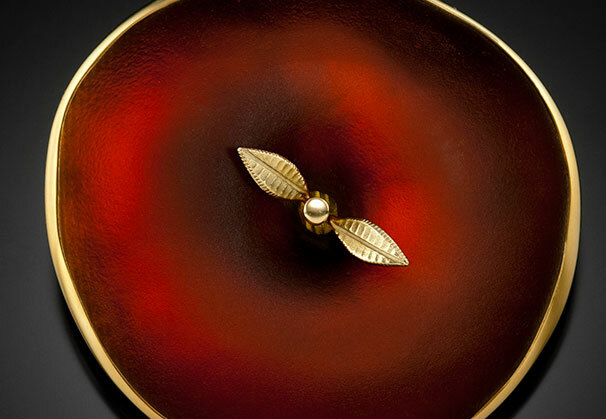 Over his 30-year career, he has earned an international reputation as a master jeweler, lecturer, teacher and artist in residence. 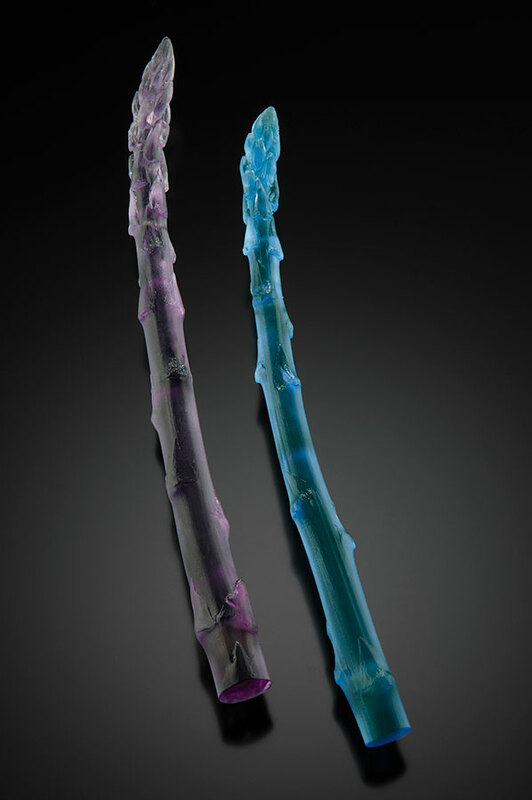 Donald is represented by Hedone Gallery which will feature him in 2015 at GlassWeekend in June and at SOFA Chicago in November. The aesthetic of my jewelry has evolved over the years, but it’s safe to say my strongest influences are the monumentality and texture of the landscape of the American Southwest, tranquility and sensitivity to materials of the Zen gardens of Japan, and the minimalism and simplicity of geometric forms. I’ve most often worked subtractively, as a stone sculptor would, grinding and carving to refining my materials. I don’t draw directly on other artists' work for inspiration; however, the sculpture of Isamu Noguchi and Andy Goldsworthy and the abstract landscape paintings of Richard Diebenkorn are all close to my artist’s heart. The addition of digital technology into my work about six years ago has been very important. It has exploded the form options at my fingertips. My Aqua Series Brooches, inspired by rippling wave patterns in water as well as the raked patterns of sand in the Zen gardens of Japan, provide a good example. They would be impossible without computer controlled machining of my graphite molds. A recent residency at the Uroboros Glass factory in Portland, Oregon, allowed me to achieve a long held desire to work in a larger scale. I was able to use the same approach described above to produce a new body of sculpture. There are few things in the world more important to me than food and humor but I had never thought to bring either of them into my art, until now. My recent Organic Series Brooches are literally made through lost celery or lost asparagus casting. By transforming these commonplace materials into glass, I hope the viewer will see them in a new light. Whether I’m working in glass or gold, I try to be sensitive to the unique visual and physical qualities of each material and to exploit them to their best advantage. Both glass working and goldsmithing are challenging and demanding. I find integrating them both in one piece of jewelry to be the ultimate test of my skills. 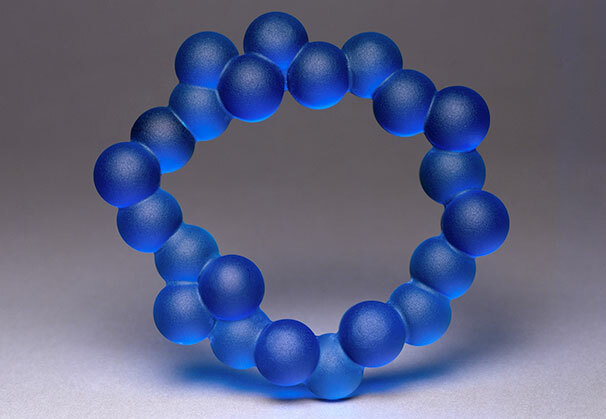 Master jeweler Donald Friedlich creates elegant jewelry that integrates studio glass with precision metalsmithing. But Friedlich didn’t start out to be an artist. With interests that ran toward math and science, he discovered his creative side while taking art and jewelry classes at the University of Vermont, and he was hooked. He transferred to Rhode Island School of Design (RISD) to take advantage of the many resources the school offered. 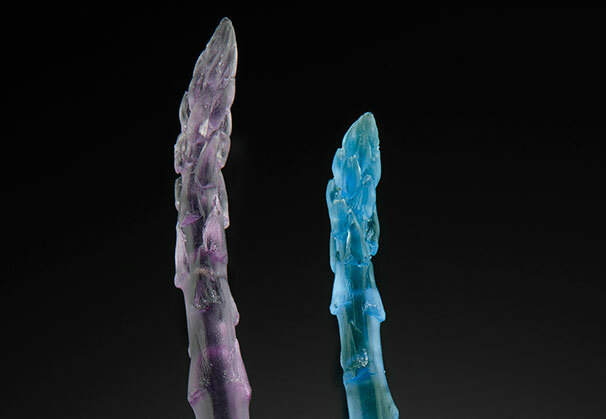 At RISD, he focused on jewelry and metalsmithing, but was also exposed to the vibrant glass program where he met Michael Glancy, Judith Schaechter and Howard Ben Tre and took a professional practices class with glassblower Dale Chihuly. Shortly after graduation from RISD in 1982 with a BFA in jewelry and metalsmithing, Friedlich’s work was being shown in important galleries and gaining notice from casual customers and collectors alike. 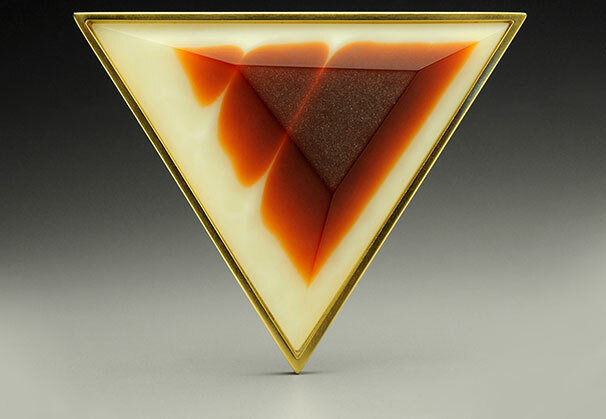 Friedlich’s interest in alternative materials is evident in his early work in slate, which he cut using lapidary techniques, sandblasted and paired with gold and precious gems to create jewelry that combined organic textures and surfaces with bold geometric shapes. 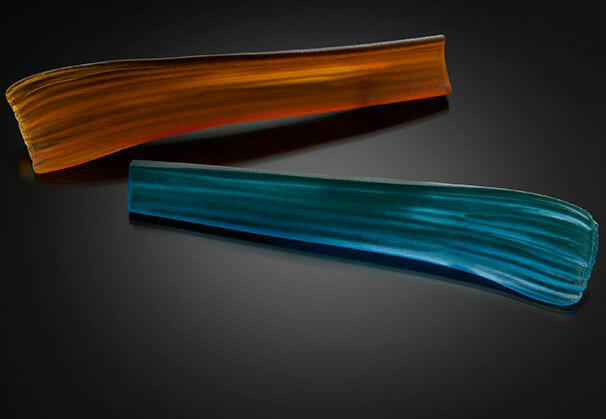 By the early 1990s, Friedlich turned his attention to glass, and by 1997 he was working with the material full time. He was fascinated by its color, translucence and ability to reflect light in response to movement. As with his slate work, this early exploration of glass consisted of coldworking – carving, grinding, etching, and sandblasting – to create abstract geometric forms. Pushing himself to develop new skills, Friedlich started taking workshops at The Studio of the Corning Museum of Glass, and in 2003 was the first jeweler to be accepted into its internationally competitive residency program. 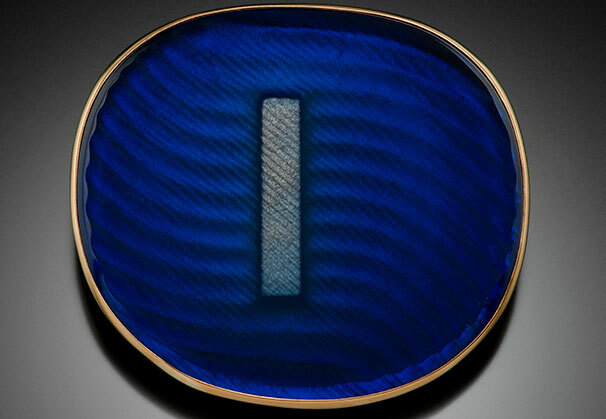 His month-long residency at Corning was highlighted by collaborations with glassblower D. H. McNabb and Max Erlacher, a former master glass engraver for Steuben. 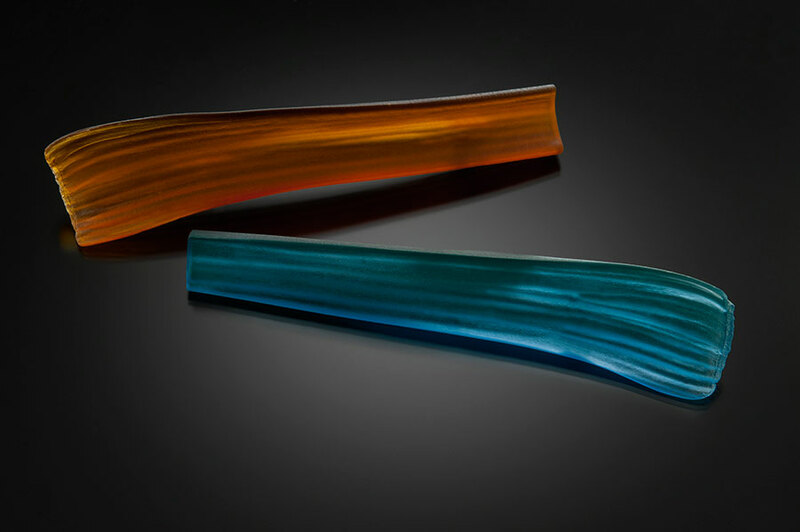 His residency and the many classes he took at Corning fostered the development of new skills and a fuller understanding of the range of glass’s creative options, and his work changed dramatically. 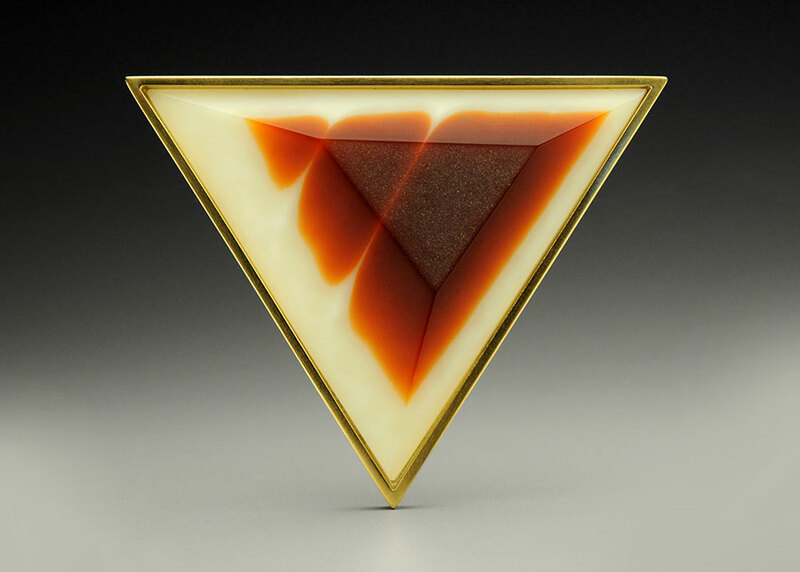 Friedlich’s current collection of glass jewelry is a major departure from the early abstract, geometric forms he carved and refined from blown or press-molded glass. Though he had never before produced narrative work, he became interested in casting every-day objects such as apples, oranges, asparagus and celery. Says Friedlich, “These are things we take for granted and become blind to, when the reality is that they are sensual, elegant and beautiful shapes.” Also, it makes him smile to wear a stalk of purple celery. Collaboration remains a cornerstone of Friedlich’s work. Because he doesn’t have his own hot glass facilities, he frequently returns to Corning where he enjoys the excellent facilities and the free-flowing collaboration within the glass studio. He also works on press-molded pieces with local artists in Madison, Wisconsin, where he makes his home, such as glassblower Shayna Leib, and he rents kiln space from a local glass shop to do his castings. 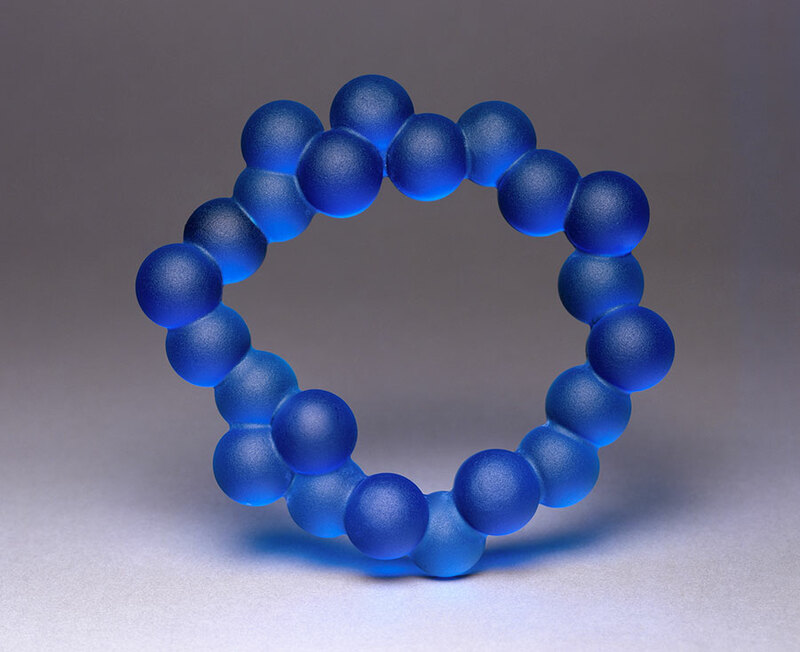 Depending on his objectives, these collaborations provide him access to a wide range of technical approaches - including blowing, casting, 3D printing, press molding and others – to create pieces of jewelry that push the boundaries of material and process. Today Friedlich is a sought-after teacher, lecturer and visiting artist-in-residence at universities and conferences all over the world. 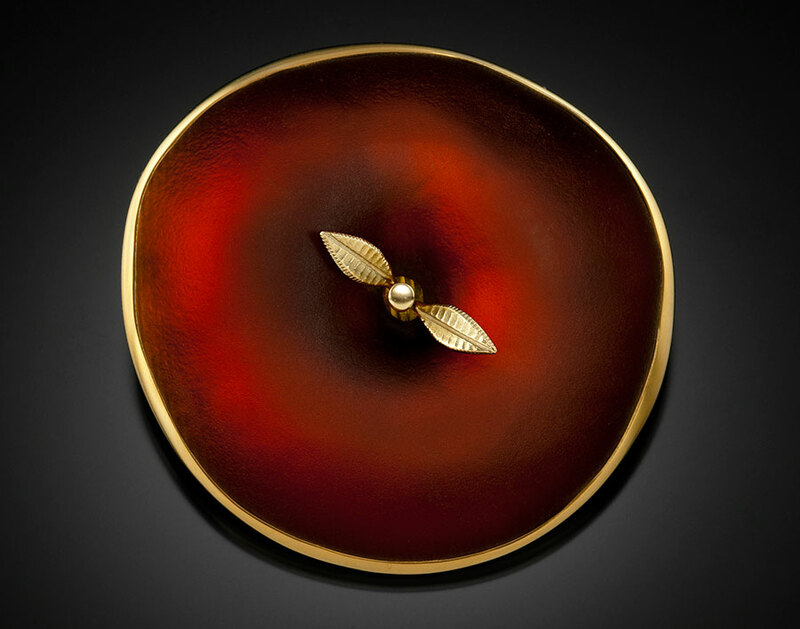 In 2004 Friedlich was a featured speaker at an international jewelry conference in Melbourne, Australia, and an artist in residence in both the glass and goldsmithing programs of Canberra School of Art at Australian National University. In 2007 he was an artist in residence at Tainan National University of Art in Taiwan. In 2009 Friedlich was the first American to mount a solo exhibition at Villa Bengel in Idar-Oberstein, Germany, and was a featured speaker at the annual Glass Art Society conference. That same year he was also an artist in residence at the glass school in Kramsach, Austria. 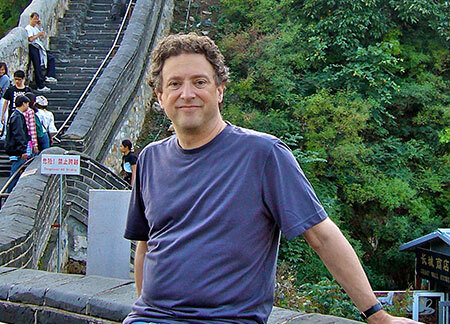 In 2010 he toured China and lectured at universities in Shanghai, Beijing and Hangzhou. 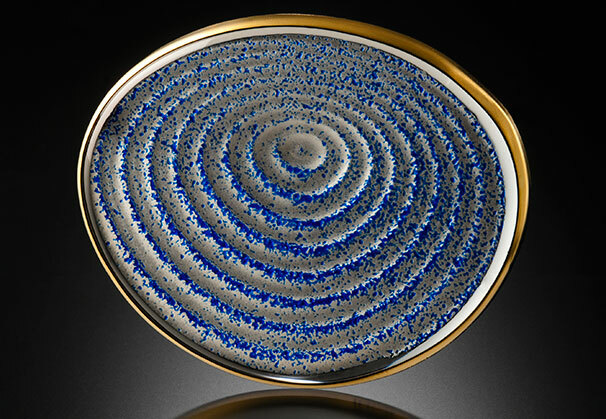 In 2011 Friedlich was the keynote speaker at the annual conference of the International Society of Glass Beadmakers and a featured speaker at a jewelry conference in Dubai, UAE. In 2012 he was an artist in residence at California College of Art in both the glass and metalsmithing programs. In 2014 he was an artist in residence at the Uroboros Glass Factory in Portland, Oregon. His work can be found in the permanent collections of the Victoria & Albert Museum in London, the Smithsonian’s Renwick Gallery, the Los Angeles County Museum, the Museum of Fine Arts in Boston, the Corning Museum, Schmuckmuseum in Germany, and the Museum of Fine Arts Houston to name a few. He is a passionate advocate for his craft and has served as president of the Society of North American Goldsmiths (SNAG) and chair of the Metalsmith Magazine editorial advisory board. 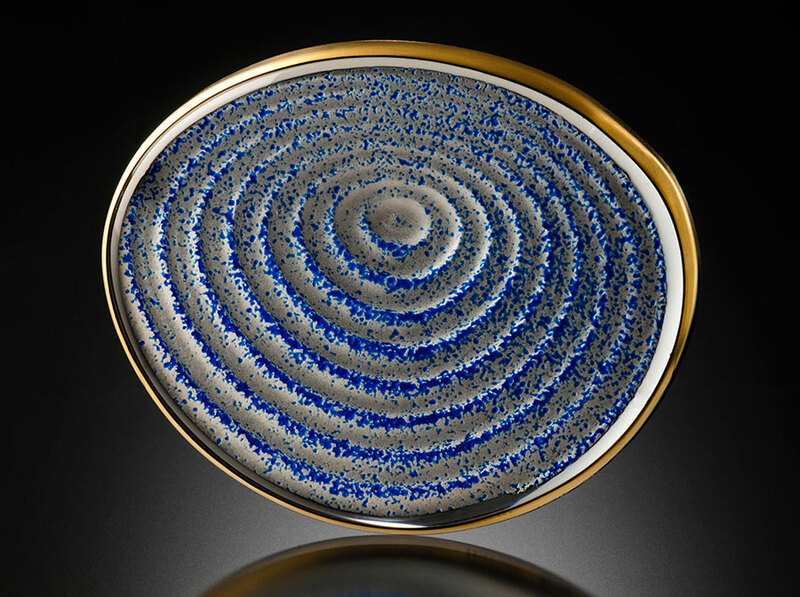 His many awards include a National Endowment for the Arts New England Regional Fellowship and the 2001 Renwick Gallery Acquisition Award at the Smithsonian Craft Show. Friedlich resides in Madison with his wife, novelist Judith Claire Mitchell, and their dog Josie.